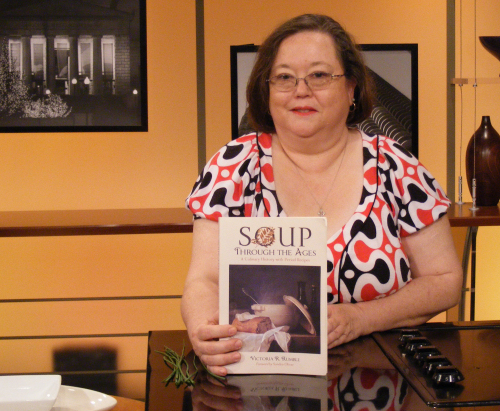 This photo was taken during my live cooking segment on WGN Chicago. Good King Henry: Perennial Green. Spooners and Spoon Holders: Gone the Way of the Dodo Bird. Estranged Children: New Epidemic or Old Problem? Is It a Flower Bed or a Flower Garden? America’s Greatest Problem: We’ve been off the Farm too Long. When is Honey Not Honey at All? Gravy Boat or Chamber Pot? Whittling: Useful Skill or Way to Pass the Time? Scuppernong or Muscadine? You Decide. Heirloom Tomatoes: What Shall I Plant? Soup Through the Ages is Released!